The three-story Dilworth House, located on Sixth Street on Washington Square, is sandwiched between the Lippincott condos and the Athenaeum of Philadelphia. A developer is seeking to build a condo tower behind the colonial-style property. The Society Hill Civic Association has filed a zoning appeal to oppose the 12-story condo tower proposed behind the historic Dilworth House on Washington Square, reigniting a fierce fight that has gripped one of Philadelphia’s wealthiest and oldest neighborhoods for the last decade. The group, which filed the appeal Jan. 17, argues that Philadelphia’s Department of Licenses and Inspections was wrong to grant zoning permits to John Turchi, the developer of the proposed high-rise. Last month, L&I gave Turchi the green light to demolish the rear portion of the Dilworth House to make room for a 10-unit high-rise and an underground, automated parking garage, so long as he first received approval from both the Philadelphia Historical Commission and Art Commission. 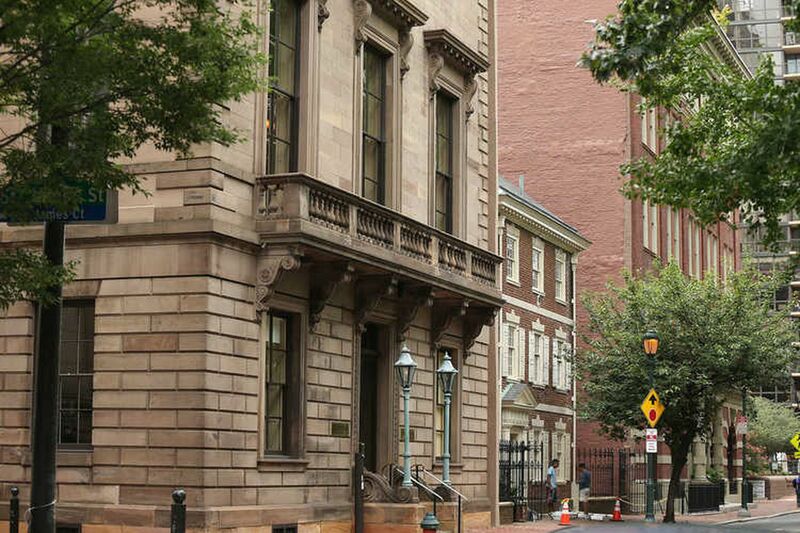 In its appeal, the Society Hill Civic Association argues that Turchi’s proposed high-rise violates zoning rules that govern the area near Independence Hall. Specifically, the groups allege that Turchi’s tower does not comply with setback requirements, meaning the amount of distance that a portion of a building is required to be from the street. In addition, the Society Hill Civic Association said, Turchi’s tower would extend past the Dilworth House’s current footprint — something they allege is not allowed for building lines established in the area after 1954. Workers Lewis Brito (left) and Carlos Mayo, pictured in 2017, prepare to paint the Dilworth House, located on Washington Square. While the appeal hearing has not been scheduled in front of Philadelphia’s Zoning Board of Adjustment, it could threaten Turchi’s plans for the site. Since 2004, when Turchi introduced plans to demolish the house and build a condo tower in its place, neighbors have fought fiercely to keep it standing. Plans and appeals have wound their way all the way up to Pennsylvania’s Commonwealth Court. All the while, the house has sat abandoned, while other high-end condo buildings — including, most recently, developer Tom Scannapieco’s 500 Walnut tower — have risen in the area. Still, even with the appeals submitted, Turchi is able to forge ahead. According to city spokesperson Paul Chrystie, developers typically can begin work on a property as soon as they have approvals from the required agencies, even before the zoning board renders a decision on the appeal. In this case, with Turchi’s zoning permits from L&I already secured, all that is likely standing in his way is Historical and Art Commission approvals before the final building permits are approved. Turchi has not yet submitted an application to either commission, Chrystie said. His current plans call for retaining the primary portion of the Dilworth House. Neither Turchi nor his St. Davids-based attorney, Philip Rosenzweig, returned calls for comment. In a previous interview, Rosenzweig said that although Turchi conceived the plan, he has not yet decided whether he will be the builder. Plans submitted to the city in 2018 and prepared by Cope Linder Architects show a tower rising above the Dilworth House. Turchi’s plans have long upset neighbors, who view the Dilworth House as historically important, more for the gesture it represents than for its architecture. When the Society Hill was reeling in the mid-20th century, then-Mayor Richardson Dilworth commissioned prominent architect G. Edwin Brumbaugh to build him a home in Society Hill as a signal of his commitment to rejuvenating the area. The three-story house was built in Colonial Revival style. It is classified as “significant” within the Society Hill Historic District. Turchi, who purchased the property in 2001 for $1.75 million, originally planned to restore it to “its former grandeur, consistent with its historic heritage," Inquirer archives show. That, however, shifted when he announced his plan for an “elegant, contemporary” condo building in the house’s place. After years of appeals and pushback, Turchi ultimately achieved partial victory in 2015 from the Commonwealth Court, which granted him the ability to demolish the home’s rear portion. The facade and main portion of the property would have to remain. According to a version of plans submitted to the city last year, Turchi’s current proposal would be about 172 feet tall and would be connected to the primary portion of the home. Some of the units appear to extend into the Dilworth House itself, according to the drawings. With its boundaries stretching from the Delaware River to just beyond Washington Square, the Society Hill Civic Association and the neighbors within it have opposed other developments, too. Some neighbors have expressed opposition to the plans for a 31-story residential tower on the grounds of Center City’s Sheraton Society Hill Hotel. The civic association also fought a developer’s former plans to build a residential building at the site of the neighborhood’s Acme.